A casual acquaintance of mine, I’ll call her Emily, recently posted on Facebook that she and her husband are looking at buying a new 12 passenger van, so she was soliciting input about the different kinds available. I don’t like to admit this because she’s the sweetest woman I know, but a part of me was envious. Jealous, even. Not because I want a 12-passenger van because I don’t, but because I would love to be in a place financially where affording a new vehicle was an option. As I went to hang up our laundry to dry in the spare room, I kept ruminating. Emily is pregnant with her 7th child. She homeschools her kids and has a mother’s helper come in once a week to help with her responsibilities and to tutor her kids. Her kids take dance and piano lessons. Now the family is buying a large passenger van. How much does her husband make? We go out to eat less than 8 times a year. We cook all of our meals at home. We have a grocery budget of $125 a week. I make our own homemade laundry detergent. I hang up the laundry to dry rather than running the dryer. We have one vehicle that is paid for and has 150,000 miles on it. My husband takes the bus to work. We buy used and clearance clothes. We have cheap cell phones that we buy pay-as-you go minutes for. We only use the cell phones for emergencies. We keep the heat at 63 degrees in the winter. We keep the air at 80 degrees during the day and 83 degrees at night during the summer. We have one small television in the living room. We find free activities to do as a family. Our kids get their books and movies from the library (though we do have a Netflix subscription). We’re doing what we can to keep our overhead low. Yet, why then, are we struggling financially as we are? I was done hanging up laundry by that time, but the question nagged me. I mentally went through all that we spend. So, one night I sat down and did a tally. That’s how much we’ve spent on medical bills (mostly dental including a root canal, a crown, and phase one of Bookworm’s braces) since January, 2015. No wonder money feels so tight. It IS tight. But, here’s the wonderful, silver lining, news. We’ve paid all of those medical bills out of pocket, without.going.in.debt!! We’ve learned our lesson as we’ve dug our way out of debt these last several years. We faced a mountain of medical bills in the last three months, but we were able to pay them out of pocket. I don’t know what my friend’s husband does for a living. I’m happy now that they’re doing well. And I’m also happy to learn where all of our money is going. We’re not doing something wrong financially. We’ve just been hit with a barrage of medical bills, and we’re handling it. How do you respond to financial setbacks and unexpected expenses? 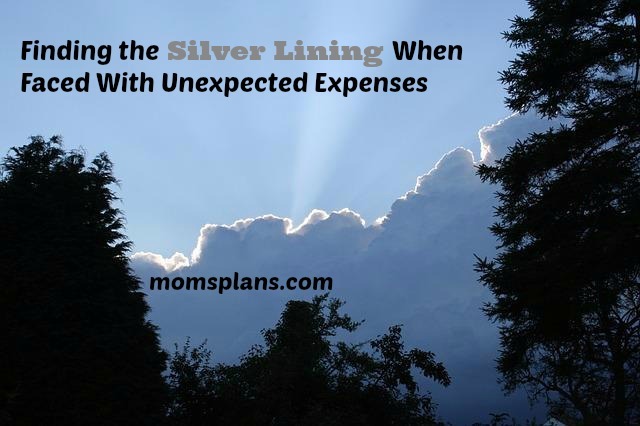 Do you try to find the silver lining?